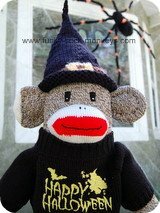 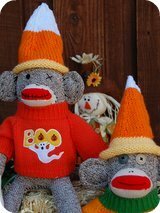 How to make a monkey hat, with free easy to knit patterns. 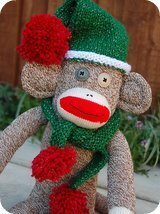 Keep yourself and your monkeys warm with these cool wool knit hats. 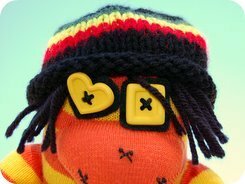 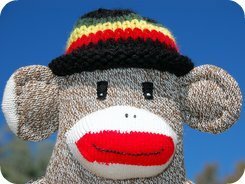 You can make these funky hand knitted hats in all sizes, from extra small sock monkey size to larger people size, the patterns are easily adjusted to fit any sized head and I'll show you how. 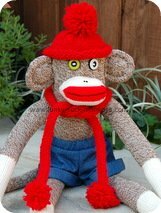 Monkeys (or people) wearing different hats is one of the easiest ways to change a style to match a season or special occasion. 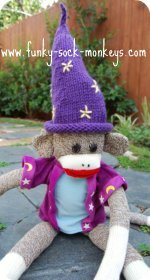 There's two basic knitting patterns, a tiny roll brimmed hat, and a tall roll brimmed hat, that you can adjust slightly to create many different looks. 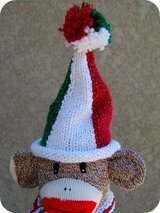 (sorry about the delay in getting these patterns up and running, they are on there way and will starting popping up one by one). 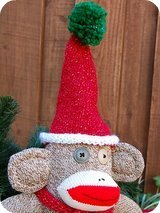 Don't forget you can embroider anything you'd like. 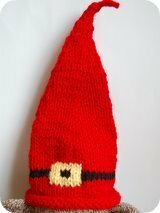 On the Wizard's hat to the left I just used yellow wool and embroidered on some star which I think helped make it look very Wizardy. 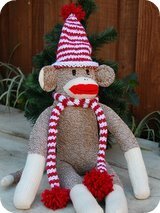 If you are wanting to knit a hat with a sock monkey face on it knitty.com has a fun hand knit hat.